There comes a time after climbing some tough summits when you decide to look at the weight of your backpack. I had recently walked 20Km to activate a summit in the Snowy Mountains, towards the end of the walk my backpack just felt too heavy. I had stopped on several occasions to rest and I remember thinking “I have to lighten this pack!” The radio I use for SOTA activations is a Yaesu FT-857, it weighs in at 2.5Kg. A great radio which covers all bands and produces 100w output. I also have a Yaesu FT-817, by comparison it weighs only 900 grams without battery pack. I hardly ever take this radio on SOTA activations since I prefer to run about 30watts output and the 817 is lucky to produce 5 watts! I had thought about building a lightweight amplifier to boost the output of the 817 to around 30watts. I looked for suitable components on ebay and this is where I discovered the MX-P50M amplifier. It was advertised specifically to suit the FT 817 and produce an output of 50 watts at a mere 500grams. My first thoughts were, “this might be one of those dodgy cheap amps, best to be avoided !” With that I decided to move on and continue looking for parts to build my own amp. I found many parts and kits available to build a small amplifier however I was curious about the little amp I had seen. I decided to do a Google search on the amplifier, I found only one positive report on eham and no other information, no circuits nor operation manual. For the asking price ($226 delivered) I decided to purchase a unit, thinking if it did turn out to be dodgy, I would simply use the components to construct a better amp. It took only a week for the amp to arrive from China. The amp ships with a DC cable, an FT-817 control cable and nothing else. No instructions, specifications or circuit! Setting up the amp is relative easy, simply connect the supplied control cable to the FT-817 accessory connector and the DC cable to a 13.8v supply. Then connect the coax output from the radio to the input of the amp. The output of the amp connects to your antenna. The amp has a manual band change switch, so check the band switch is set to the correct position before transmitting. Not having any specifications, I had no idea what power level could be expected. I connected a power meter and dummy load in line and decided to test initially on 40M. Applying 3 watts AM carrier from the FT-817 produced 30Watts indicated on the meter. On SSB a whistle into the mic produced 50watts indicated. So far so good, I proceeded to try the other bands and was delighted to find I could produce 45watts PEP at 28.5 Mhz and 50 Watts PEP on 3.585Mhz, Note the voltage reading of 13.3v. Here you can see the full output from the FT-817 producing a healthy 50watts PEP on the 30M band. I conducted tests at a higher input voltage (14.5v) and found the amp can produce more power output if required. I did find some specifications for the encapsulated RF device inside the amplifier stating it can accept input voltages up to 24v to produce 100w output. I am not going to try it, the results could be catastrophic! 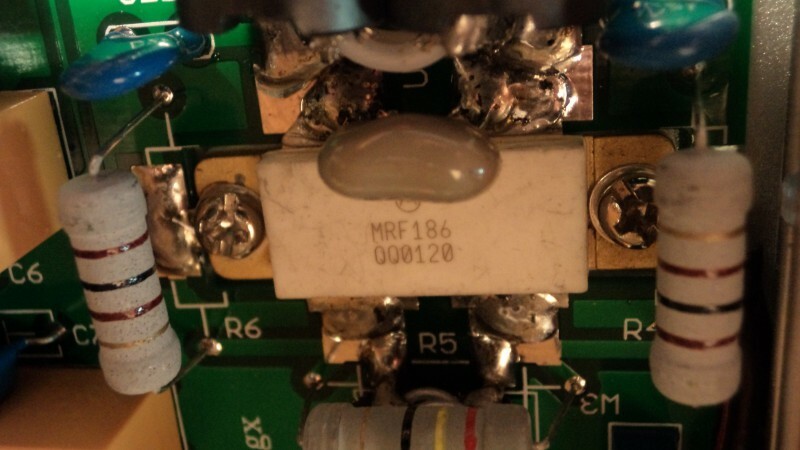 The MRF 186 encapsulated RF device as used it the amplifier. Also an internal view of the amp, showing the filter layout and circuit arrangement. Having tested the amplifier into a dummy load it was time to put the amp “on the air” I started with 40Metres and called CQ with 5 watts only. Vin, VK3FMOL replied and reported a 5×4 signal received at his location. I asked Vin to check my signal strength again this time with the amp on line. My signal report was now 5×8, but more importantly Vin said my audio level had increased quite a lot to the point where I was readable above the noise. At that point Scott VK7NWT broke in to provide his report. He had been listening and was happy to report the same, an increase from S4 to S9 with a large increase in received audio level. Scott also reported he had tuned across my signal whilst I had been talking with Vin and could find no evidence of splatter or bleed over, thanks Scott. Seems like this test had a few people interested because Ray VK3NBL was next to call in and report he had no particular signal increase but a noticeable audio level increase. Ray had also been looking at one of these amps, but like me was dubious about the quality. As it turns out I had contacts with four or five others whilst using the amp and all the reports were similar, a noticeable increase in audio level and no change in quality with some reporting a signal strength increase also. During the tests I noted the amplifier remained cool to the touch and the current drain was around 6.5 amps on voice peaks. I have been asked several times if this amplifier can be used with radios other than the FT-817. The answer is yes provided you can supply the correct RX/TX control lines into the amplifier. The amplifier is supplied with a connecting lead and attached plug suited for direct connection to the FT-817 Accessory socket. I have taken the time to check which connections are made to the FT-817 and they are as follows. The Black or in some cases Blue control wire from the amplifier is connected to ground or GND (-VE) on the radio and the Red control wire from the amplifier is connected to TX GND from the radio. So to operate the amplifier in transmit mode it is a simple matter of shorting the two control wires from the amplifier together when transmitting and open circuit them when receiving. Some people have asked if there is a way to use the FT-817 CAT control and the connection for the linear amplifier simultaneously. Well in fact one of those people was John Schultz who not only asked the question but provided the answer via a file he found on the net from a SK Charles Socci K1DNR. I have provided that file for download here:simultaneous-use-of-cat-control-and-linear-amplifier-on-yaesu-ft-857d Thanks John for sending me the file and thanks to Charley K1DNR. Recently my amplifier destroyed the in line fuse every time it was connected to the DC supply. A quick investigation revealed there is an 18v Zener diode used as a form of protection circuit. This diode had gone short circuit causing the fuse to blow. I replaced the Zener with a suitable type and have not had any problems since. There was no apparent reason the the diode to become faulty, unless I inadvertently reversed the DC connection polarity. Maybe I had a seniors moment hi hi! In conclusion I can recommend this amplifier to anyone looking to boost their FT-817 output to around 40 watts. I will continue to run 30 watts as usual. For me this amplifier will now accompany the FT-817 on my future SOTA activations. My FT-857 will be installed in the vehicle which will lighten the backpack by 1.1Kg. A good saving! Thank you for taking the risk of purchasing and testing this amp. I bought a Tokyo Hy-Power HL-45B right after they went out of business. I love the HL-45B, but I am nervous about taking it with me on SOTA hikes. The wilderness is tough on electronic equipment. The HL-45B is now somewhat of a collectible piece of gear due to no longer in production. This inexpensive Chinese copy may be just the answer I’m looking for rough outdoor use. Just read the review of the amp. Good job, Rob. I, too, had been looking at that amp for a while. My ONLY concern would be spectral purity. Has anyone put this amp on a spectrum analyzer? If so, what did it look like? Any spirs? How about harmonics? I have not put the amp on the spec analyser as yet. However I plan to do so when I am next in the radio workshop at head office. All on air reports indicate no in band issues so far. I use a 4 cell LiPo battery. 14.8v 5000mAH Turnigy brand. I use this connected via a full wave bridge rectifier to drop the voltage 1.2v it works fine the amp can withstand up to 24volts! glad you did this review, now I will get one! Can you run the radio and amp off the same battery? Yes I run the ft817 and the amp of the one battery. It works great. tks for the great review, that was really helpful! I was thinking of buying the amp for a while and eventually pushed the “buy it now” button for USD 208.94 after stumbling across this page today. I often got a little frustrated with the 5 W of my FT 817 and I hope the little PA adds a reasonable amount of power without draining the battery too quickly. Vy 73 frm Germany! I’m ready to take the plunge and get one off these amps. Any particular seller in China that I should use? Which seller did you use for your amp?? Thanks, Rob. I will use your source as you had good success with them. There are a bunch of folks from China selling them! All around the same price point. Looking forward to getting it and putting it on the air! Thanks again. THanks Rich, I hope you have as much success with it as I have. I’m looking to run an hf amp for sota and stay around 25w to work with my end fed dipole gear and other qrp antennas. Do you know the current draw on this amp at 25w? What is the input wattage needed for 25w out? Also if I were to use this with Olivia mode which is hard on finals, what kind of heat is this generating for extended operation? Thanks for your review. I am using the amp for SOTA on a regular basis, I find the current draw is between 6-9 Amps on voice peaks using ssb. I have no trouble using the amp and FT-817 combination from a single 4 cell LiPo battery. This combination can easily last all day depending on the amount of transmitting. Eg: I can activate 3 summits with an average of 30 contacts each from a single battery. 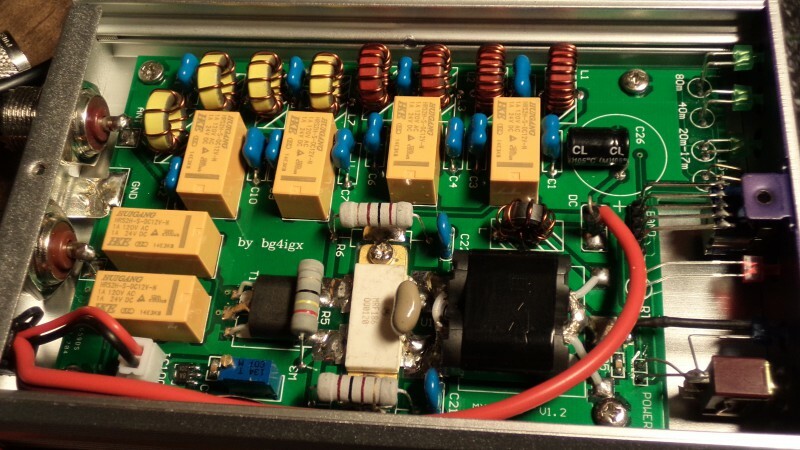 3-5 watts pep input easily drives the amp to the 25-45w output on 40m band. I have used the amp for SSB only, so all I can say is the heatsink does become warm (not hot) after 30 contacts at full power. However I beleive this is normal. Ohm’s Law: P=IE Current: I=P/E Remember: Power output is about half of the input power (rule of thumb due to the efficiency of the devices) therefore, for a 25W output the input power would be approximately 50W. That would mean with I=P/E I=50W/12V= 4.17A. This would be current draw under key down, full duty cycle. I’m not familiar with Olivia but most of these digital modes do not require full power output to communicate. As a matter of fact PSK-31 and some of the others require very little RF output making them ideal for QRP. That is an excellent price. I’m considering buying a second one to modify for 6 metres. I am facing the same situation – connecting the mx-p50m to my X1M. Did you solve this barricade in the meantime? There are no informations about the pin-logic from the FT-817 ACC connector comming from the amp. You are correct the CAT cable supplied with the amplifier is not for auto band switching, it is used for changing the amp into transmit mode rather than activating the amp with RF input only. The amp does require a keying line to be connected, it does not RF sence. However it is a simple process as long as you have a way of getting a keying out of your radio. do you know what pins are being use by the 817? i am having trouble finding them. Hi Rob. Have you used the amp for CW? I am looking to boost my Icom 703 to just 15W (rig has output adjustable up to 5W) and I believe I would be able to put together a suitable CAT lead so I could drive it with 1.5W. I’m particularly interested to use it 15-10m. Do you have any experience that could advise on this? I have not tried the amp on CW yet, however I have used it on 10m SSTV and it works fine,it does switch quickly, I managed 45w pep output from the FT817 with about 4-5w input. On modes like SSTV it does get hot at full output. I am sure you could operate an ic703 at low power 1.5w to provide the 15w output you are looking for. The amp outputs approximately 10 times the input power, it differs on each band a little. Hope this helps. The above text is taken from an earlier post re the amp, can you tell me if you did any of the above tests and if so what were the results. Not as yet, I have just ordered a new mini spectrum Analysler off ebay and am waiting delivery. Once it arrives I will complete the tests and also do a write up on the analysler. I read your blog post before I bought my MX-P50M. It arrived yesterday and I’ve just put it through some tests on the bench. Although I can’t get more than 35W out of it I’m quite happy with its performance – I only wanted 20-30W anyway. Thanks John, I’m surprised you can only manage 35watts from your unit. I measured 40w a 9dB gain from mine. I did run mine at 14.5v though. Do you have access to GM4SLV’s blog and spectral analysis for the MX-P50M? I have attempted contacting GM4SLV via twitter and have not received a response. I can not access his blog and I would really like to read the analysis. Sorry I don’t have access to that blog either, I don’t know what has happened it is unfortunate since it was a very good blog. I have an MX-P50M which does a great job with an output of 100 watts with minor mods. The only mods required are replacing the diode with a 22 volt rating. This is not an ordinary diode so make sure the letters match.With 16V its good for 80w and the only other thing is the fan which i have fastened on top and connected the wires to the amps voltage lines. This keeps the amp cool enough for continuous ssb operation only. Specs are about the same as an unmodded amp. How do I get access to the above link? I’d like to read your spectral analysis on this amp. Looks like the author of that blog has made it private now, I will remove the link. Thanks for the great review Rob and also to John GM4SLV for the spectrum analysis work! 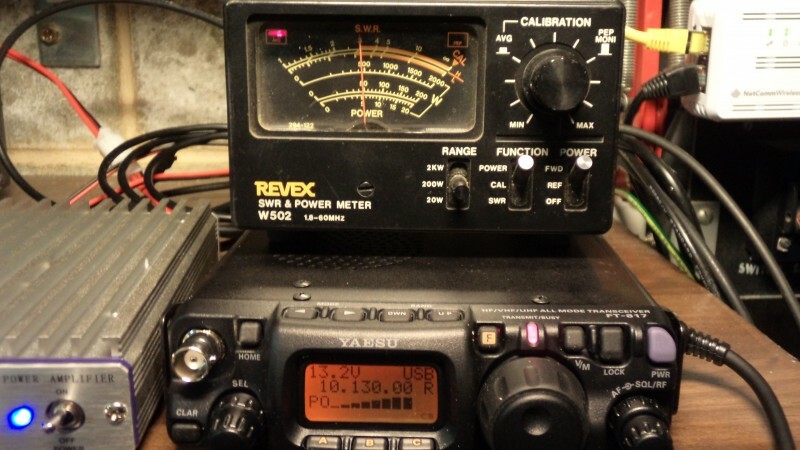 I am ordering one of these for my FT-817 as we speak, after having been on the fence a while. One thing is, I want to be able to use both the DATA and ACC ports for my HRD program and Easy Digi interface to run the RTTY/other digital modes from the laptop. I suppose I could make a small break-out box or Y-cable that would still allow me to raise +DTR (or whatever it is) in the power amp to bring it online, while still connecting to the radio with my Laptop and HRD. I’d appreciate any input you guys might have on this. I suggest a break out box is a good idea. It may be possible to obtain the data port pin out information. You may find the pin connections required for the amplifier are different to those needed for your accessories. Well I got the amp and it checks out fine on all bands. I’m pretty pleased with it. I haven’t had any luck finding any purpose-built breakout boxes yet, but I do have the pin-out data for my rig. When I get the time I’m going to stick a scope on the amp cable and see what’s what and when I’m able to cobble something together I’ll get back to you all with the details. Have you tried operating the amp with a 12 VDC power supply. It would be great if the amp and the FT-817 could both be operated from a sealed lead acid battery. However, I would expect the output power of the amp to be reduced. I have operated both the amp and the FT817 together from my home power supply which is 13.8v. Both work well at that voltage. I did do a test with both units connected to a sealed lead acid battery at 12v and could hardly notice the difference. I still had more than 20w pep output on SSB. I have not tried the amp below 11v however it still performs quite ok at that voltage too. Hi, I have a FT 817 and also this amplifier. I have some spare li po battery’s that I use for my FT817. I thought I would try these batteries with the amp. They are 11.1v 35c 5500mAh. However when I’ve connected this battery to the amp I don’t get any of the power or band selection LEDs to come on. Will these LEDs normally light up when connected to power or only come on why transmitting? I’m thinking that the 11.1v is too low? It was a power pole issue. You say you tried the amp at around 11v. Do you have any idea of the watts delivered by the amp at the different output powers of the FT 817 when running at 11v? 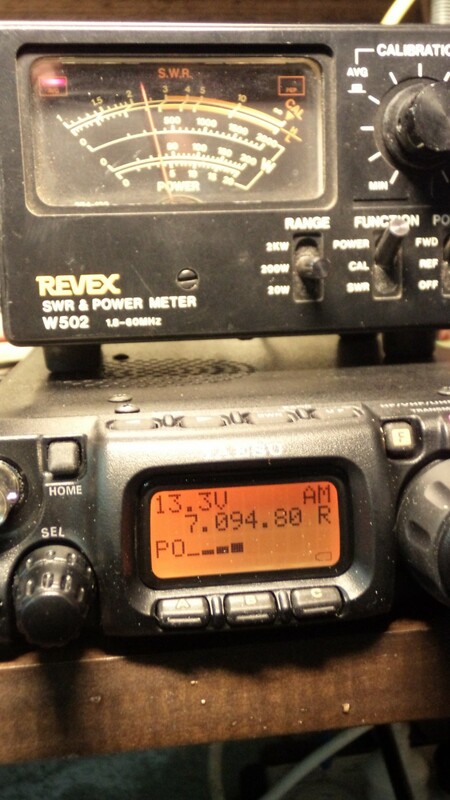 The output at 11V was around the 20- 25w mark on 40m. Hi, I was wondering if someone could share the exact “blue lipo” battery they are using and where I can get one? Currently I use the hard case type of Lipo battery, they are available from Hobbyking they also have the blue soft plastic sleve type. The amp does not come with a circuit or any instructions at all. The output stage is a chip device not transistors. The output device is available on ebay should you ever need one. For the price I thought it is good value especially since it is light and easy to lug around. I’m going to buy this AMP for my 1W SDR TRX. Can You suggest how can I control the AMP? I can have only GND and +12V out of TRX while transmiting, but it is only few mA. The amp has a pair of control wires (red and Black from memory) that appear at the rear next to the 12v power leads. It is simply a matter of connecting these wires together when you transmit and opening on receive. I suggest you connect one of these to ground, then the other to the pin on you radio that goes to ground on transmit. Should work fine. OK, I will have to check how much power does amp take to be controlled, maybe it will be safer to use some power MOSFET photovoltaic relay. Hi Lukas, the current drain is minimal, if your rig has a relay output it should be fine, otherwise you could use an interposing relay driven by your rig, this would ensure you would not damage the rig if it has a ttl switching output. I received my MX-P50M a few days ago and could not be more pleased. 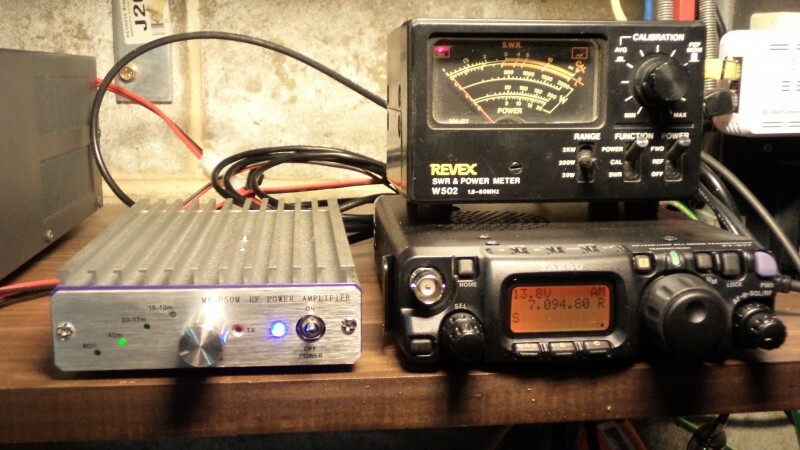 I am now able to keep up with world wide JT65 and BPSK31 with my FT-817… The amp is small, keys perfectly and quickly for CW and the digital modes I run. I was heartened to see this excellent review and felt more confident in ordering it from China on eBay after reading everyone’s comments… I paid $180 shipped and it arrived quickly and in perfect shape. Excellent little amplifier, one word of caution, pay attention to the supply voltage, I accidently allowed 16 volts on the supply from a 4 cell lipo battery whilst operating portable, the amp started blowing fuses, when I checked inside I found an 18volt Zener diode had shorted obviously put there for protection, so I just replaced it and all is fine now. I’d be interested to know which diode it was that you blew. I’ve had an ‘interesting experience’! I haven’t really made great use of the amp as yet, I don’t do a lot of /P operation, but it has seemed to deliver OK. Then one day I contrived to connect my battery the wrong way round, which blew the fuse on my battery box but everything else seemed to have survived. Much later I detected a rattle when I picked up the amp and on removing the cover discovered the remains of D5, a TVS diode. The amp works fine without it so long as there are no destructive transients on the power line … but I’ve replaced it now! The faulty diode was an 18volt Zener which was across the 12volt input circuit. I’m guessing the one inside your amp would be the same, quite right you could use the amp without it, in fact people tell me they can supply the amp with higher voltage and achieve more than 50w output. As far as the CAT cable goes, it has been suggested that it should able to connect it to 3rd party headset/mic adapter where a foot switch could be connected. A Y adapter off the footswitch should be able to not only open/close the mike,but the amp as well. Now – does anyone know the name of he connector on the opposite side of the included Cat-62 cable? Has anyone built a cable to go from this amplifier to the KX3? Do you have schematics? Looking to try to use this with the KX3. I understand that it must be a resonant antenna unless you use an external antenna. does anyone know the name of this connector on the other side of the CT-62 cable. I need a new one and can’t identify it beyond the MD-37 it is marked with? I am not finding anything. The connector looks like an S video connector, often seen on older video cameras. Unfortunately – what you are describing is the CT-62 end of the cable. I am looking for the other side of the cable – with the 2 wire connector. Thanks anyway. I can’t figure out which ft-817nd ACC pins to use to make my own cable. Great post. Is there a way of connecting the amp and an ATU at the same time? If not how do you go about tuning your antenna? I ask because I have just purchased an FT-817 and MX-P50M. Yes you can connect a tuner also,just connect the tuner between the amp output and the antenna. I sometimes use a manual tuner and have had no problems. I found an excellent article on building an adapter for this exact purpose, unfortunately the ham who wrote it is SK. Once I discovered that, I downloaded the page and saved it as a .pdf before his entire site disappeared. It is the only how to reference I ever found on the web for this particular mod. I can email the .pdf to anyone interested in building a split out cable to use both the amp and an auto tuner, and rig control simultaneously. Sounds like it’s a good mod, I would be happy to have it available for download on this site if you send me a copy. I’m very interested in viewing the pdf of the mod John Schultz describes. Can you forward a download link? Thanks. Great review of the MX-P50! I have placed a link to download the file in the body of the review text. Looks like the transistor is rated for 12db gain at 28 volts, which would be around 80 watts or so. I’ll have to remove my 18 volt surge suppressor when mine comes and try it to see if the bias circuit still works correctly at higher voltages (and also that the keying voltage is under 13 volts!). Then, it will be fan time! Thanks for the spectrum analyzer tests – it convinced me to buy this amp. I had expected unfiltered -10db third harmonic type stuff, and this actually has a LPF! Thanks for the detailed review, I just purchased one for my 817ND. I’ve wired the ACC plug to the control wire and when I have that plugged in and the amp turned on, both the blue power light and the red TX light are on and it knocks my receive volume and signal level down. I’m positive I wired to the correct pins, any ideas what is causing my problem? Has to be operator error or defective unit. Thanks for any input. I suggest disconnecting the ACC plug from the amplifier, then check to see the red TX light is off. If this is the case then you will need to check your wiring of the ACC plug. If the red TX light stays on with the ACC plug removed, then there may be a fault in the amplifier. There may be other problems that can cause the hi swr, the very first thing to do is check your patch leads between the radio and amplifier and amplifier to antenna are in good condition, ie not short circuit or open circuit. If the patch lead are ok then please check you have it wired correctly, make sure you are using the correct antenna port from your 817, then make sure it is connected to the radio in port of the amplifier, you also need to check you have the band switch on the amplifier set to the band you are transmitting on. The most common hi swr problem comes from the amplifier being connected the wrong way around, I understand you wired it the same as a working unit but it is still worthwhile checking again, also to prove your amplifier is working correctly simply swap it out with your brothers amp and check its ok. Let me know how you go. I’m sorry to hear of your trouble with the amp, I hope the vendor does the right thing and issues you with a replacement. If you have no success please let me know and I will add a caution to my write up regarding the particular seller. 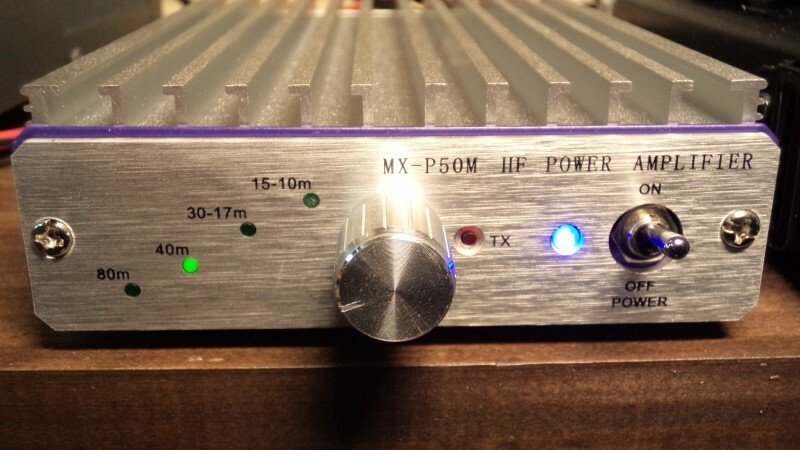 Hi Rob, The ebay vendor has given me a full refund on the MX-P50M so all good, I decided not to have a replacement amplifier and shall use the FT857 I now have. Best Regards Paul. That’s great Paul happy to hear you received a refund. Will a 12volt 9800ma h battery operate this amplifier? I think the answer is yes. Which would confirm my belief that my battery is faulty. The battery you describe should power the amplifier, however that depends on other devices you may have connected to the battery, my suggestion is to measure the voltage across the battery connection when using the amplifier if it is too low (below 11.5) there may be a problem getting the amp to work correctly. Rob, thanks for making available all the comments on the MX-P50M linear. I purchased mine from this Chinese ebay vendor at https://www.ebay.com.au/itm/282586885095 – $221.95 with free postage and it only took 6 days to arrive from China to my Quorn (SA) QTH. I use mine with the mcHF SDR TRX. The acc socket (TX PTT line) is operated from an optoisolator but was not able to activate the linear’s TX relays. A simple PNP transistor switch circuit (transistor and 330k resistor between base and emitter) was built inside the linear and it works like a treat. The linear does run quite warm to hot as I’m in a warm location – a small computer style fan looks like the next project. It runs well with 2 to 3 watts input. I’d love to see more detail, perhaps some photos of the modification! Thanks for your information Peter, I am sure others will find your comments helpful. I would be happy to add any photos or circuits you might want to show others to this Blog. Thanks for the great review – my amp is on order! I have been using the MFJ 904 it is small size and easy to use, it can also take a beating. The amp uses an MRF186 which is rated 120W/28V. I tried to run the board and lpf on 24V and its putting out 90+W on 20 and 40. Havent tried the other bands but this looks promising. I guess for stationary use with power and cooling at hand this is quite an option for a little more kick on your uBITX, SDR or whatever QRP radio. For SOTA a 3S Lipo will do for sure. Thanks for excellent review. I just received my MX-P50m and did some tests. It works fine at 13Vdc and 4W input it does 50W output on all bands. If you provide 16Vdc then output increases to 65W. So I assume, if operated at 20-24Vdc the amplifier will make almost 90-100Watt PEP out. The rf stage is an MRF186 and rated at 28Vdc. Question: has anyone tried to make a VOX-PTT circuit to include in the MX-P50m ? That’s correct, if you were to supply a higher voltage the amp will output more power, however you would need a larger heatsink. The amp has an 18v zener diode in the supply input circuit that will need to be changed for more than 18v supply. I don’t know of anyone who has made an auto switching circuit, might be an interesting project. SOTA Chaser/Activator name sheet and log.